The warrior is one of the most revered members of Kiowa culture. In honor of Veterans Day and T.C. Cannon’s own service in the U.S. Army, this panel with Tatiana Lomahaftewa-Singer (Choctaw/Hopi), Curator of Collections, IAIA Museum of Contemporary Native Arts (MoCNA) and Warren Queton (Kiowa), University of Oklahoma Tribal Liason Officer and Black Leggings Warrior, will examine how Cannon comments on war in his artwork and how his reverence for warrior society was portrayed in some of his most celebrated pieces in the Nancy and Richard Bloch Collection. 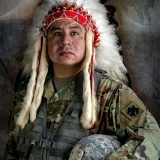 CPT Warren Queton is known by his Kiowa name Phaw Ah Tahlee, which is interpreted as “The moon is coming.” He is from the Cherokee, Kiowa and Seminole Nations. He is 12-year veteran of the United States Army and has served in combat theaters Operation Iraqi Freedom and Operation Enduring Freedom. He currently serves as the Commander of the 1245 Transportation Company, Oklahoma Army National Guard. In his civilian career, he serves as the University Community Tribal Liaison Officer at the University of Oklahoma. CPT Queton is 10-year member of the Kiowa Black Leggings Warrior Society. Tatiana Lomahaftewa-Singer (Hopi/Choctaw) is the Curator of Collections at the IAIA Museum of Contemporary Native Arts (MoCNA) in Santa Fe, NM. She holds a degree in Fine Arts Administration from the University of Arizona, Tucson. 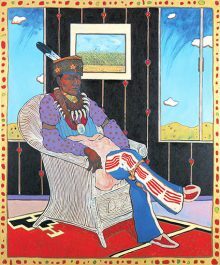 Some of Lomahaftewa-Singer’s exhibitions include: Linda Lomahaftewa The Gift of Art, iCon: A Tribute to Allan Houser, Lloyd Kiva New: Art, Design & Influence, 50/50: Fifty Artists, Fifty Years, Drawing from the Collection, Voices from the Mound: Contemporary Choctaw, Valjean McCarty Hessing Honored, Bon a Tirer, and Lifting the Veil: New Mexico Women and the Tricultural Myth. 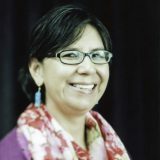 She currently sits on the New Mexico Capital Arts Foundation Board, the National Parks Arts Foundation Advisory Board and has juried numerous art programs including the Southwestern Association for Indian Arts Fellowships and the Santa Fe Art Institute Visual Arts Review Committee.